A properly drafted, thoughtful business agreement is crucial to the success of any corporation, limited liability company, partnership or joint venture. Businesses depend on agreements with other businesses, individuals and partners to operate, thrive, and run efficiently, effectively. It is highly recommended businesses use formal written agreements, when conducting or engaging in business transactions (or forming a corporation, LLC, or other type of business entity) that state the parties’ expectations and provide dispute resolution mechanisms. Business agreements are important because they help account for negotiations, agreements between parties, specific terms and conditions, and ensure the parties are getting what they bargained for. Most importantly, if a conflict does arise, written contracts are enforceable by a court. 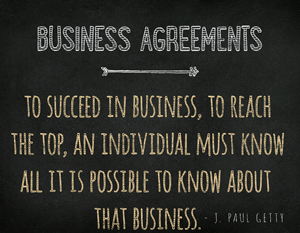 Well-drafted business agreements ensure the parties’ interests and expectations are represented. A business agreement states the terms and conditions imposed on a particular transaction or business formation. These contracts state what parties’ duties and responsibilities are, outline the business’s financial and functional decisions, and delineate how disputes, if they arise, will be resolved. A properly drafted, thoughtful business agreement is crucial to the success of any corporation, limited liability company, partnership or joint venture. More importantly, if a conflict does arise between the member of an LLC, shareholders/officers of a corporation, or partners of a partnership, well-drafted written contracts are enforceable by a court. In Illinois, business agreements are subject to an implied covenant of good faith and fair dealing. The covenants of good faith and fair dealing are generally provisioned for in a well-drafted agreement. This means that a party to the agreement agrees to act in good faith and agrees to deal fairly with the other, and not cheat the other party of the benefit of the contractual bargain. The covenant of good faith and fair dealing gives a party discretion to perform or not perform, or requires the other party to perform, or refrain from performing, under certain conditions. Under this implied covenant, parties must act consistently with the parties’ reasonable expectations, exercise discretion, with proper motive, and not arbitrarily. Without written agreements, enforcement of contractual bargains is difficult. By hiring our law firm, one of our corporate lawyers will draft an agreement whereby clients can ensure their interests are bargained for, negotiated for, and accurately represented by the business agreement. This allows for minimal misunderstandings and allows businesses to run efficiently, effectively.